Trigeminal neuralgia pain along branches of the trigeminal nerve. “Neuralgia” means pain along a nerve. Nerve pain is particularly challenging because of its intensity. The trigeminal nerve is a three branched (“tri”) nerve that covers a large area on the side of the face (see image). 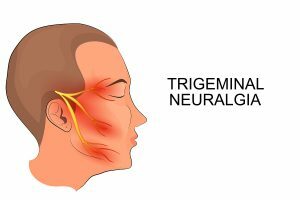 Trigeminal Neuralgia is a very painful condition usually affecting one side of the face. Something has irritated the trigeminal nerve, which results in the sensation of pain – this is the perspective from western medicine. When Qi cannot flow, it backs up, gets stuck, and it stagnates. Wherever Qi stagnates, there is the potential for pain. Meridians are the pathways where Qi flows. There are several meridians on the sides of the face but two, in particular, almost mirror portions of the trigeminal nerve. The San Jiao (or Triple Heater) meridian wraps tightly around the ear and then travels to the outer eyebrow (see image below). 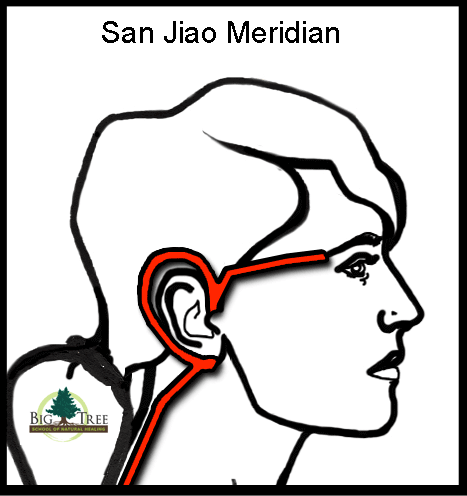 The San Jiao Meridian is on both sides of the head. 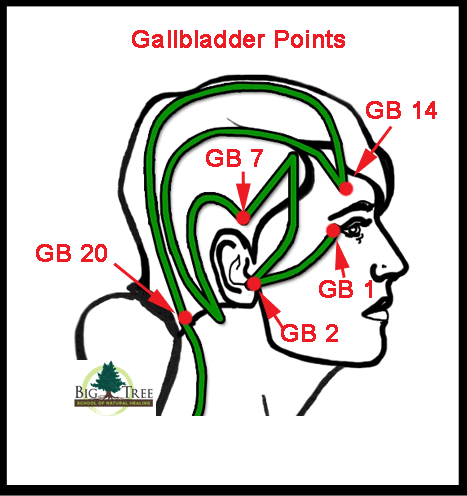 The Gallbladder meridian crosses the sides of the head several times, and also passes close to the outer eye and ear (see image below). 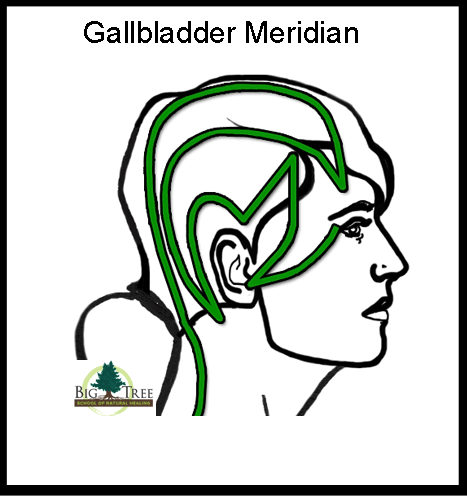 The Gallbladder meridian is on both sides of the head. Since stagnant Qi can give rise to pain, let’s move the Qi to relieve the pain. This is a simple premise that yields great results. 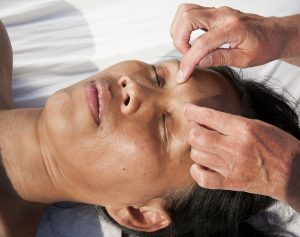 By activating a few points on the Gallbladder and San Jiao meridians, we help move the Qi in order to relieve the pain. Make very light contact with these points, especially when there is pain. Ask the person you are working with to tell you how much pressure feels comfortable to them. It is likely that the amount of pressure that is best will vary from point to point, so keep asking for feedback. 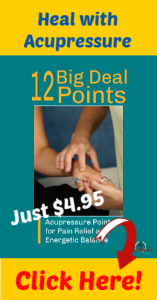 Use the soft tip of your fingers or thumb to gently contact acupoints. With the soft part of your finger or thumb on the point, think about gently sinking into the point. I find that “sinking into a points” creates more comfortable contact for my client than “pushing pressure” into points. Because there is so much pain and sensitivity with trigeminal neuralgia, making gentle contact is of the utmost importance. 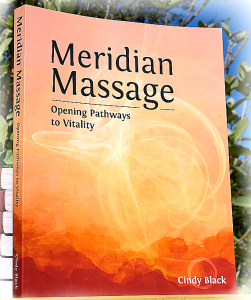 We are assuming that the pain is coming from Qi that is not moving through the meridians. Therefore, the intention of our contact with the acupoints is to help get the Qi moving again; maintain this intention while contacting the points. If it is comfortable to your client add tiny, gentle, circular motions in order to help move the Qi. To continue learning, check out the “Trigeminal Neuralgia Support” video on demand. I am diagnosed with trigeminal neuralgia and is has been randomly episodic for me … always triggered after a plain old dental cleaning appointment. The first time I was 20 years old and was given vicodin … it worked. The next time I was 50 and no pain killer worked, I had to go on neurontin and that was only semi-successful. I’ve heard each time it comes back is worse. This last time was debilitating. But I did go for craniosacral work and chiropractic to help get my body back into better alignment. The San Jiao (Triple Warmer) made me think back and in both cases of the severe pain for TN, there was intense stress going on in my life. I’m going to make use of this blog and apply this to a self-care routine. Thanks! I hope these points offer you relief. I’d love to hear any results that you notice, please write back when you have the chance. Good explanation, excellent images! Thank you from Mexico City! 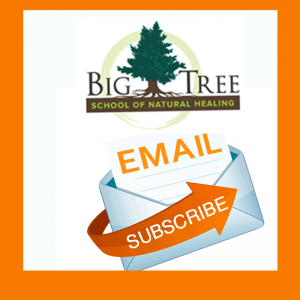 Thank you Cindy so much for this protocol … I have used these points with a client that has continued issues with chronic trigeminal neuralgia with much success. That is great news! I appreciate your expertise, as is your skill is the real key to getting results. After bone loss, tooth extraction, then crown & root canal in neighboring moler. The bone has all come back very well by using symphytum. But residual ‘toothache’ like pain in lower and upper points. Thank-You for this info! You are welcome – I hope this helps! sounds like something I get a few times a year for short periods. I work on some of those points every morning. I will use them next time I get the problem. I like the idea of sinking into the point. I have had a client with TMJ (Temporomandibular Joint) disorder. Could these points help for this as well as even though its not a nerve pain. Yes, these points great to help with TMJ too. Last month, I had dental work, & the most severe lower jaw pain, accompanied by eye, & ear pain. Even though the crown work was on the top, all the pain was in the lower jaw. After 5 days, bruises started appearing, & the pain started to subside. Bruising lasted over 2 weeks! The only explanation the dentist could give was the novocaine shot must have hit the muscle. That sounds painful, I’m glad you are getting back to balance. If you try these points, use gentle pressure, and let me know how it goes for you. My trigeminal neuralgia is on the right side of my face. Should I be addressing the points on both sides of my head/face, or only on the affected side? Yes, I would contact the points on both sides of your face. Go slowly, very gentle contact. If the points on the affected side are too tender to touch, spend extra time on the other side. Was just diagnosed with TN last Monday. No pain meds (the big ones) helped. Now on Neorontin which has helped, but still get the twinges. As a graduate from Aromahead Aromatherapist Certification, I wrote on the forum and Michelle lead me to this article. THANK YOU for making it public for everyone. This with the addition of my oils will certainly help. I have a MRI with contract brain scan (hope they find my brain because I feel I’ve lost it!) Tuesday so the massage points will help pronto with my nervousness of being in the machine for the hour they’ve told me I will be. Thank you again. Take good care of yourself – combining your knowledge of essential oils with the points may prove to be very helpful! I have TN and I was wondering what essential oils have you found to work and how/where do u apply them? I’ve tried several, but none has helped my TN. I’m desperate for relief! Thanks! I am so sorry for your pain! In addition to any treatment your doctor has recommended, you could look to the essential oils of Helichrysum, Bergamot, Peppermint, German Chamomile, and Geranium to name a few. Perhaps creating an inhaler with a combination of 3 of the above would be a good start (5 drops each). I have found Oblas oil and peppermint oil helps. I also have TN. It started in 2015. I have had it for the last 4 months and am going to a physical therapist who I think is helping me. He is massaging mostly the back of my neck and has also given me neck and back exercises to loosen up the muscles. I am also taking Lyrica which I think is helping. I can’t take the other meds mentioned. They did not help the pain at all. I am also a voice teacher and singer and it was difficult to even open my mouth at times. Thankfully, it is subsiding now. I think the cooler weather is helping. Does this all make sense? I am glad that you are getting relief with PT! I am not familiar with Lyrica. It sounds like you are moving in the right direction and having great results with your PT – trust your experience and gut instincts. There are many approaches to every condition. Since you are getting relief and improvement with your current approach, I would continue with it. I was diagnosed with TN last year in 2017. It started with little pains/shocks in my teeth & now pain in my head at times. I was on Tegretol for a few months . I thought the TN had gone away so came off the meds. It has now come back every so often with pain in my teeth & head again. I will try the things you recommended. I see a chiropractor & also plan to see a physio therapist for more help. I am 51 & this is not the way I hoped my life would go. I get down sometimes. Wish it would all go away. Give these points a try as they may provide some relief. Use very gentle contact, a little at a time. I find your article great. It was sent to me by my daughter in New Zealand. Eight years ago I was diagnosed with Trigeminal Neuralgie. I had work done on my two front teeth. Immediately after the visit to the dentist we left for New Zealand. Was a very long flight . A few days after we got home after a lovely two month stay. I seem to have it basically under control. But now every time it does strike is worse and quite scared. I have found if I keep as unstressed as possible, no cold wind on my face and enough sleep it seems to be better. I am on Degranol. I take half of a 200mg tablet every morning with my high blood pressure tablets. I am 74 yrs old. I have tried not taking the half tablet that does not work. After a few days the neuralgia sticks its neck out. If I do get an attack I have a full tablet for a day or two. I imagine others will benefit from your clear personal awareness of how other factors impact your symptoms. I hope you are able to keep moving toward balance and ease – thanks again for writing. I am been treated with medicines for about 6months now with little to no relief. Could you please share if a daith piercing could offer some relief? I do not know what that treatment is, so I cannot say anything about it. I am sorry you are in pain, you may want to consult with an Acupuncturist in your area, they may be able to help. Thank you so much. I have been making use of your information about pressure points for TN for a couple of months now with great relief. With your permission I want to share it with others who suffer with this frightful affliction. I am so happy to hear that you are getting some relief!!! Yes, feel free to share with others.